It's April and hopefully the warmer weather is right around the corner. I love the color of these roses! Instructions: Card size is 6 x 6”. Cut cardstock to 12 x 6”, score on the long side at 6” and fold to create card base and round corners. Cut paper from the Patchwork Daisy Paper Collection to 5 7/8 x 5 7/8”, round the corners, ink the edges with Forget-Me-Not ink and adhere to the inside of the card. Cut white cardstock to 5 7/8 x 5 7/8”, round corners, place in rose embossing folder, run through diecuting machine and adhere to card base using dries clear adhesive. Cut white cardstock to 5 x 5 3/4” and diecut both edges using the Regal Borders and Pockets Die. Sponge both edges with dries clear and sprinkle with Rajni Chawla’s Crystal Clear glitter. 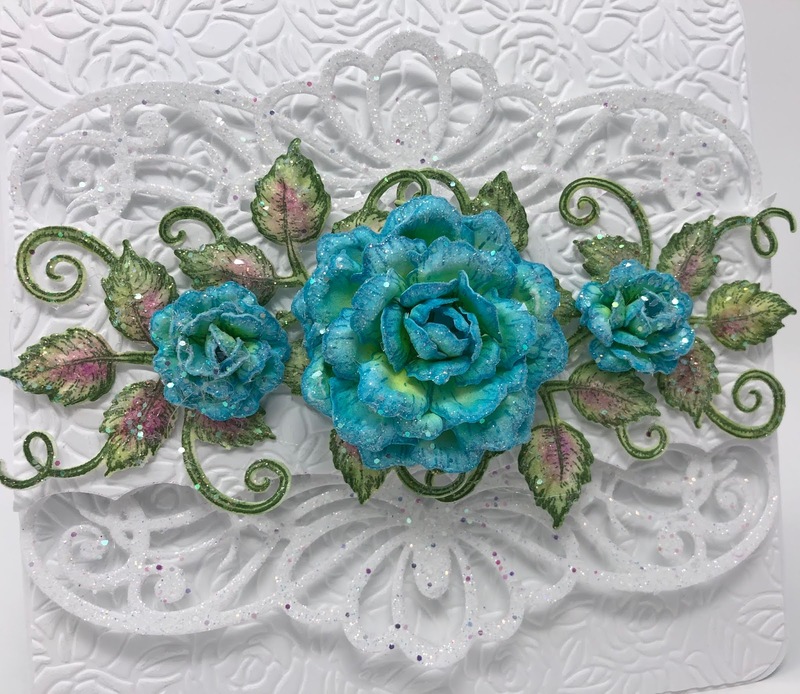 Using the edge die from Regal Borders and Pockets Die, cut white cardstock 2 3/4 x 5 3/4”, place in rose embossing folder, run through diecuting machine and adhere to decorative Regal Border diecut using dimensional tape. 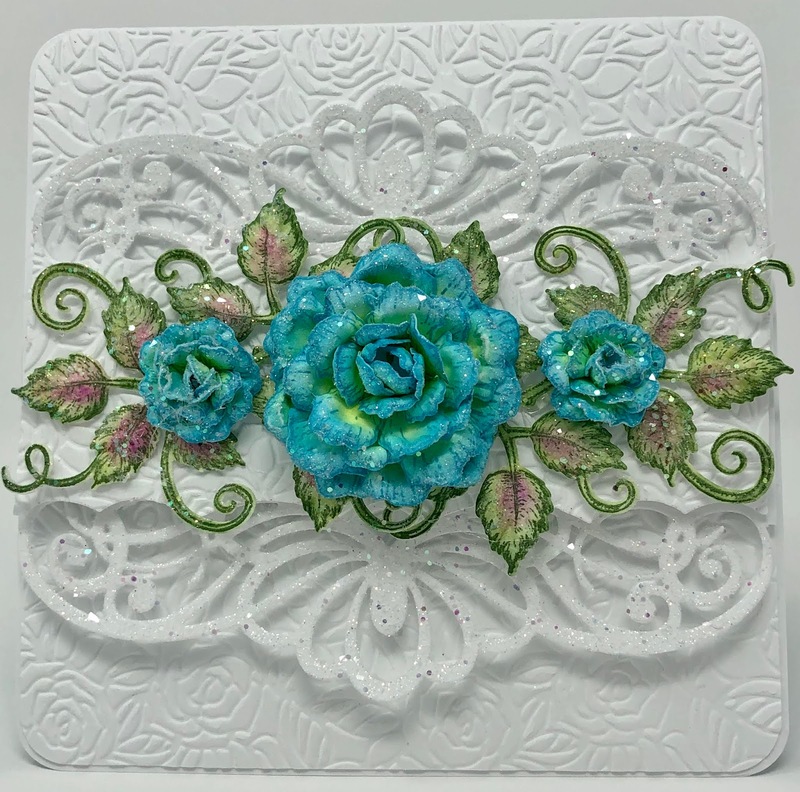 Adhere Regal Border Decorative die to card base using dimensional tape. 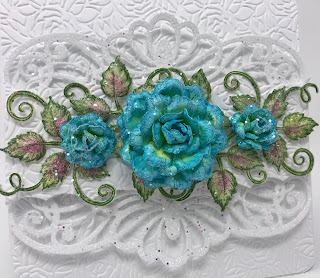 Stamp the classic rose on Deluxe Flower Shaping Paper using Forget-Me-Not ink, color using Vivid Chartreuse and Forget-Me-Not inks, diecut using the coordinating die and shape using the Rose shaping mold. 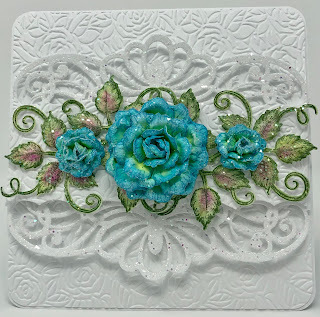 Finish shaping using the Deluxe Flower Shaping Kit. 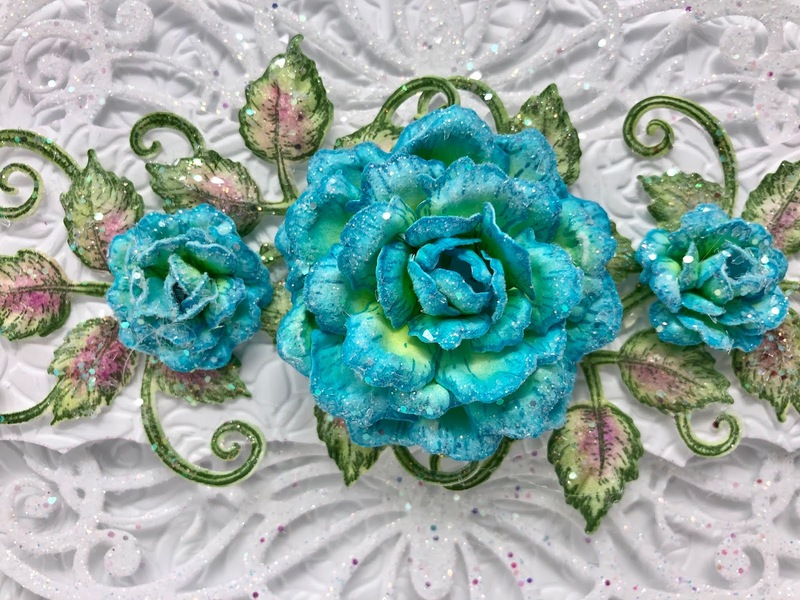 Layer petals together to create roses. See video above. Sponge with dries clear adhesive and sprinkle with Rajni Chawla’s Crystal Clear Glitter. Stamp the leafy accents stamps on Deluxe Flower Shaping Paper using archival olive green, color using olive, leaf green and Cactus Flower Inks, diecut using the coordinating die, place in the Leafy Accents Mold, sprinkle with water and run through the die cutting machine. When dry sponge with dries clear adhesive and sprinkle with Rajni Chawla’s Crystal Clear. 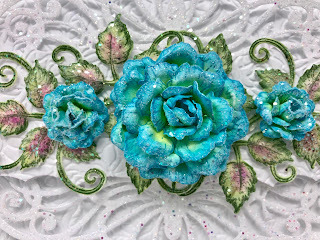 Adhere the roses and leaves to the card base as shown. of the beautiful projects created by the fabulous design team. Till next time, have a beautiful day! Beautiful roses Janet! I love your gorgeous card! Thank you so much sweet Robin! I love those gorgeous flowers, the color is awesome!!! !